"...given our current century, any theory align with tribalism is doing more harm than good to our nation." February 21, 2015 (SSB) — I often argue that for a prospective scholar to be an effective political scientist, he/she has also to be a social scientist. This is for the reason that some of the political riddles such as war and conflict are inherently social, rather than political, controversies. Consequently, such fundamentally complex problems can hardly be defined and unraveled using one theory or perspective. In most cases than not, the rising scholar would invariably end up addressing one cause of the puzzle, leaving the rest unattended. Politics, unlike other professions in academic endeavors, is broad. For instance, there is no one, single lens to look at, summarized and debate political issues independently without considering some other factors that could be potential contributors to the issue at hand. Therefore, this critical review examines a new political theory recently proposed by one of the South Sudanese upcoming scholars in his two-part article: “The Principle of Tribocracy”. The theory is tantalizingly christened ‘tribocracy’ and it is billed as the panacea for all of our troubles in South Sudan. 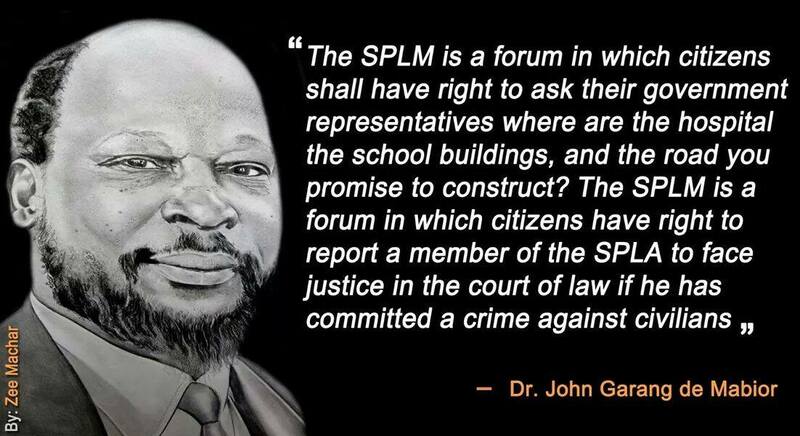 PaanLuel Wël, the managing editor of PaanLuel Wël: South Sudanese Bloggers (SSB) and the author of “The Genius of Dr. John Garang” and “Return In Peace (R.I.P) Dr. John Garang“, has written several articles about South Sudan politics and history. In his new theory, PaanLuel Wël, who graduated from the George Washington University (USA) with a double major in Economics and Philosophy, argues that tribocracy is the only salvation for realizing equality, justice and fairness in power sharing, and thus achieving political stability in the young republic of South Sudan. In part one of “The Principle of Tribocracy”, PaanLuel Wël defines his theory as a “political system where representatives of a particular ethnic group hold a number of government posts proportionate to the percentage of the total population that the particular ethnic group represents in order to promote and achieve fair and equitable political representation across all ethnic groups comprising that particular nation”. The author gives a second interpretation that define tribocracy as a “system of governance in which equality in political representation in the national government and/or at the state level is achieved through the principle of equitable and fair tribal representation”. Why and how tribocracy would salvage the young nation embroiled in a deadly civil war is yet to be fully understood. However, part of it can be glimpsed in part two of “The Principle of Tribocracy” where the author meticulously employs the census numbers of 2010 to arrive at what he called ‘the four tribes of South Sudan’ from the known sixty-four tribes. He inventively re-interprets the meaning of political caucus and political constituency to chart a new political theory that can, assuming his methodology is accurate, be used to share power equitably among the sixty-four tribes of our country. Generally, PaanLuel Wël’s newly invented political theory of tribocracy is indeed one way forward in an attempt to provide ideal solution to the tribally-motivated wars and conflicts that are threatening the political stability of numerous countries in Africa. To be noted well is the fact that PaanLuel Wël’s political theory is coming against the backdrop of other invented political theories from South Sudanese scholars such as the New Sudan Vision of Dr. John Garang, the Garangism of Dr. Lual Achuek, the House of Nationalities popularized by Jacob Jiel Akol and Dr. Adwok Nyaba, among others. Nevertheless, PaanLuel Wël’s political philosophy of tribocracy explains in depth how the theory could bring political changes. The best part of the theory is in part two of the article where the author has invested mush of his time and effort breaking down sixty-four tribes into four. Part two reflect a lot of logic and how well the author has stayed true to his theory. He correctly explains how the sixty-four tribes would be represented and how power could be shared among them. However, as I mentioned it at the beginning of this critical review, in order to be an effective political problem solver, one has to be open-minded about all the possibilities pertaining the problem at hand. In my opinion, tribocracy is a tunnel build to aim at finding the gold at rainbow’s end without studying the actual colours of the rainbow, the colours of which are so bright enough for driver to see the road toward the location of the gold. In simplest form, Tribocracy is designed to address one contributor to South Sudanese conflict and that is ethnicity, leaving hundreds of other contributors untouched. Theoretically, finding a particularized solution to a particularized political problem begin with definition of the problem itself. In doing so, a prospective scholar has to ask him- or her-self the following question: what is the fundamental problem of South Sudan? For further illustration, the scholar must ask why there are no roads, hospitals, schools and good sanitation in South Sudan? Secondly, the scholar can then ask if the current appalling living condition is remotely related to why people kill themselves in our nation? Is this related to why government officials cannot govern the country in harmony? If the problem is power as cited by many people, then what is power? How do you major power? Is it about position or physical infrastructure? Is about military power or economic power and if so how is it suppose to be shared by all the sixty four tribes of South Sudan and what level of power can be given to each tribe and region for them to feel satisfied and well represented under a tribocratic government? Generally speaking, PaanLuel Wël’s theory of tribocracy is great and well illustrated. However, one weakness is that the theory downplays some of the major contributing factors that any political analyst should never have overlooked. One major contributing factor to the troubles in South Sudan that PaanLuel Wël didn’t bother to consider is the impact that social factors play in politic. Although tribocracts like PaanLuel Wël may view politics as nothing more than haggling over power, there is indeed a strong correlation between power, social discourse as well as culture. Misguidedly, tribocracy forecast ethnicity has the main cause of political chaos in South Sudan. Tribalism is one of our problems, it is not the only problem we have in South Sudan. There is corruption, nepotism, mismanagement of national resources and bad leadership in general. Moreover, I believe there are only few individuals in South Sudan who care much about having their tribes represented in politic. The reason that tribalism is seen as the main factor is because there is no real great leader that is well equipped with knowledge to lead all the sixty-four tribes of South Sudan in a fair and transparent way. Should there be a leader who cares about giving journalists their freedom of expression, elderly people a sense of security, women their share in high positions, schools for children, roads for businessmen, hospital for the sick and academic institutions for intellectuals, it would be only few people who cares about having their tribes represented in a tribocratic governance. Although there is higher level of illiteracy in South Sudan, current generation of youth is emerging with some promising perspectives of looking at South Sudan contemporary politics. Many of them have different expectations about what they want from the government. Essential services such as building schools for school going children, roads for business people to transport their goods and make profit, and healthcare centres for the sick people, are top on their expectations from the government. Roughly, around 62% of young people do not care about which tribe should have the presidential seat as long as the person in charge knows about the importance of service delivery to all the disadvantaged citizens and have the skills to make it a priority. When President Kiir lied to himself in 2011 that he will form his first cabinet not by tribal representation but through qualifications, I was delighted. However, the president didn’t follow his promises, but rather took a wrong turn by handpicking members of his cabinet through loyalty and friendship rather than qualifications. PaanLuel Wël’s referenced this in part one of his tribocracy theory and argue that qualification do not matter in South Sudan. I don’t agree with that view because I believe that our leaders should be selected and appointed based on their qualification, not tribal representation. Tribocracy theory does not fit well in the contemporary era where skills matter. What if we were to represent all the sixty-four tribes with unskilled persons; would that make scholars, businessmen, school kids, sick people, feel satisfied? What if there were Salva Kiir of Greater Bahr el Ghazal, Riek Machar of Greater Upper Nile and Wani Igga of Greater Equatoria, would that still move South Sudan forward? We are in era where human brain is the most powerful thing on top of tribes. It is important for South Sudanese young population to start looking beyond tribes and begin to invest on ideas, skills and qualifications. The reason why some people are optioning for political representation is that government officials turn to be in favour of intellectual youth from their tribes, and businessmen from their states. For instance if you are a degree holder and have no one in the government, it is unlikely that you get a government job. And if there is a big project from a foreign government like the Chinese to build road or hospital or schools, the first thing that come to our politicians minds is to build it in his or her home state. It is this desperation that lead people to favour political representation for all ethnic tribes so everyone can have equal share of government utilities. But this is failure in leadership, not because of ethnicity. In conclusion, PaanLuel Wël has done well in proposing an all-inclusive system of governance that could, if build upon by others, help South Sudan achieve political stability. The argument presented in the theory is logical and the illustrations are interesting. However, given our current century, any theory align with tribalism is doing more harm than good to our nation. I personally think that political theory of tribocracy in this case has ignored major elements that are important in creating South Sudanese national identity as well as ignoring main contributing factors that are the root cause of political chaos. It is recommended the author should look far beyond ethnicity as the main cause of political instability in South Sudan. PaanLuel Wël would be better off considering social factors when looking for solutions and be political scientist as well as social scientist when addressing them.